You don't want to miss out on any news and you are interested in practical tips on how to use our media? Simply sign up to receive our free newsletter. It is published three times a year and informs you about new media as well as current studies, events and portals from the worlds of OER, education, and STEM. Would you like to teach the topic of environmental protection to your class in a diverse, easy-to-understand way? 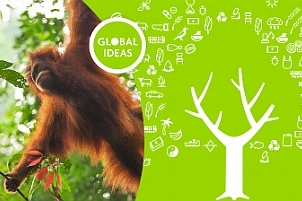 With the free Global Ideas learning packs, the environmental series from Deutsche Welle, you can use an effective, exciting multimedia approach to cover topics such as plastic waste or the forest. The target group is students between the ages of 12 and 16. The materials illustrate worldwide correlations and offer a compelling global approach. The videos, articles, and interactive Web documentation consist largely of journalistic content by Deutsche Welle prepared for use in teaching. Specially developed games, posters, experimentation instructions, and worksheets round out the offering. Handouts for educators help you prepare and teach the units. You can use the contents online, download them, or request to have a printed version sent to you with a DVD. The materials are available in German, English, and Spanish and may be used by educational institutions for non-commercial purposes. "Teilchenmodell Rauch" from B.Lachner under a CC0 license. The platform offers more than 150,000 pieces of clipart on various topics in the form of abstract representations, drawings, and illustrations. The search and download features are also simple and easy to use. Users can also upload their own clipart to the platform, make it available to the public, and discuss it with the community. Under the Creative Commons license CC0, the author waives all rights to the material. The clipart enters the public domain and may be used without restriction. © Science on Stage Deutschland e.V. Lilu, a fantasy creature, explores a house together with Alina, a young girl. Wherever they go, whether to the living room, the kitchen, or the bathroom, there’s always something to discover! 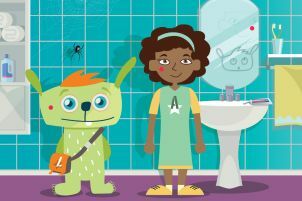 The brochure presents Lilu’s and Alina’s observations in fun and entertaining experiments, teaches basic scientific skills, and simultaneously fosters the children’s skills in reading, writing, and speaking. The experiment units are complemented by a methodology section plus texts and tasks at different difficulty levels. 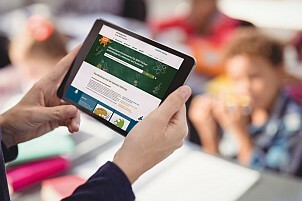 The brochure and additional materials – developed by elementary school teachers from seven European countries – are available in English and German. You may download them free of charge from Science on Stage. GeoGebra is free math software that gives you a simple, dynamic option for creating assignments, tables, and diagrams for algebra, geometry, analysis, or statistics. The platform now features over one million materials created by teachers and available under an open license for teaching math and science. There’s something for every age group and class level, from basic arithmetic assignments, calculations of the volume of various bodies with customizable size parameters, calculations and presentations of derivative functions, and integrals of various function types. This allows students to explore and internalize interrelationships, prepare for exams, and increase their knowledge either on their own at home or with their classmates at school. The software and app are free for anyone using them on a non-commercial basis. The app can be used either online through a browser or offline through the downloaded software. 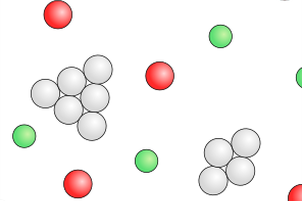 All the materials are available at no cost under Creative Commons licenses, typically CC-BY-SA. No registration is required to use GeoGebra. What is the perfect curve of a ball’s trajectory? What special attributes must football field turf have? What is the World Cup’s carbon footprint? The greater subject of soccer, or association football, is also perfect for discussing STEM subjects: Twenty teachers from fifteen European countries have developed twelve teaching units that illustrate how the popular sport scores goals in biology, chemistry, computer science, mathematics, physics, and technology classes. The brochure offers secondary school teachers a broad interdisciplinary spectrum of experiments – from air density measurements in the ball to the impact of energy drinks on players’ physical performance to calculations of the likelihood that a penalty kick will succeed – giving students the opportunity to independently discover and research the scientific phenomena of football. 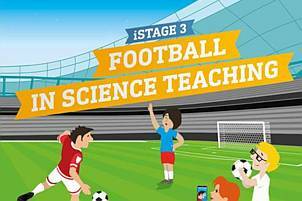 “iStage 3 – Football in STEM education” is available for free download in English, German, Spanish, Hungarian, French, Polish, Czech, and Swedish. The first day at the OE Global Conference: Opening address by conference chair Willem van Valkenburg. 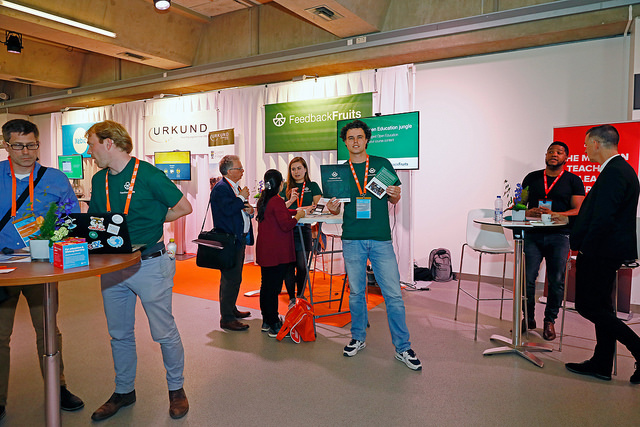 Participants had the opportunity to learn about different projects related to open education at informational stands. 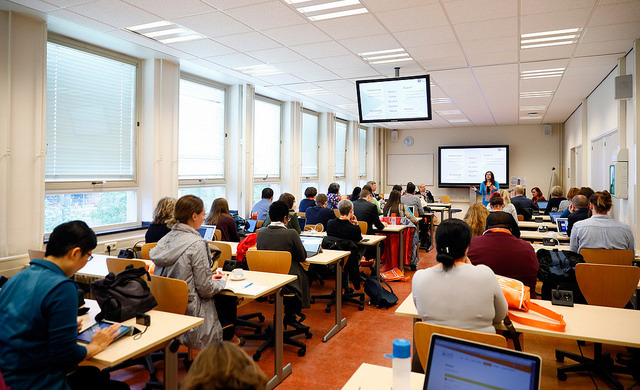 During various lectures at the OE Global on all aspects of open education, a number of teachers became students again themselves. 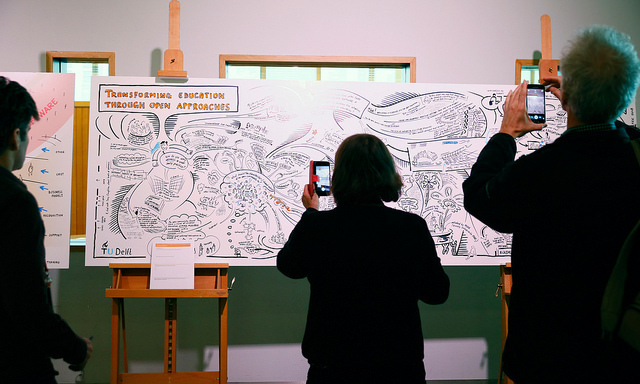 A somewhat different recap of the motto “Transforming Open Education through Open Approaches”: The discussions were documented in calligraphy. 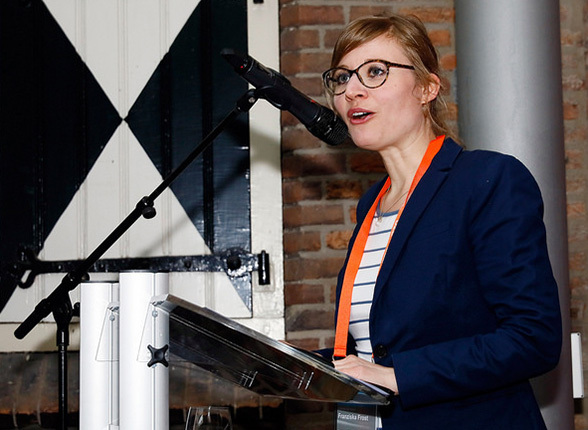 Dr. Franziska Frost from the Siemens Stiftung at the awards ceremony during the OE Global Conference in Delft. On behalf of the Siemens Stiftung, Dr. Franziska Frost gave the speech honoring the winner of the Educator Awards of Excellence. 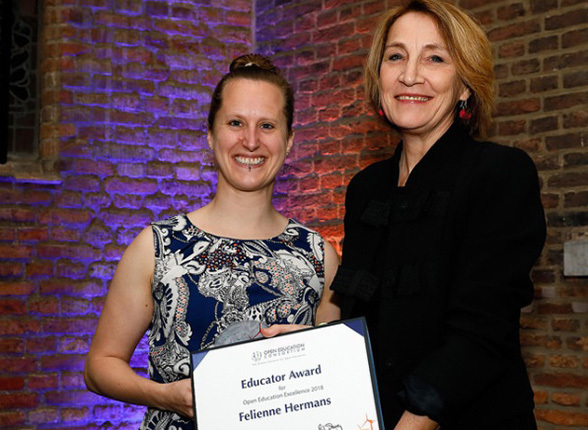 One of the winners of the Educator Awards of Excellence: Felienne Hermans (left) from the Delft University of Technology was awarded the prize for her dedication and her open online programming courses. This year, the Siemens Stiftung was on hand with a special task: During the official awards ceremony, Franziska Frost presented the Educator Awards of Excellence for innovative projects that promote the development or use of Open Educational Resources. One of the awards, for example, went to Lee-Ing Tong, a researcher from China. She has developed open statistics courses that support over 53,000 learners worldwide. 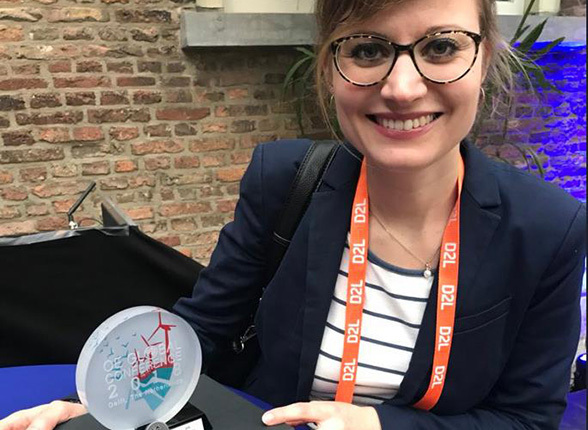 Another award was given to Felienne Hermans from the Delft University of Technology. A supporter of open online education, she has founded several massive open online courses (MOOCs) to train children and teachers in programming. 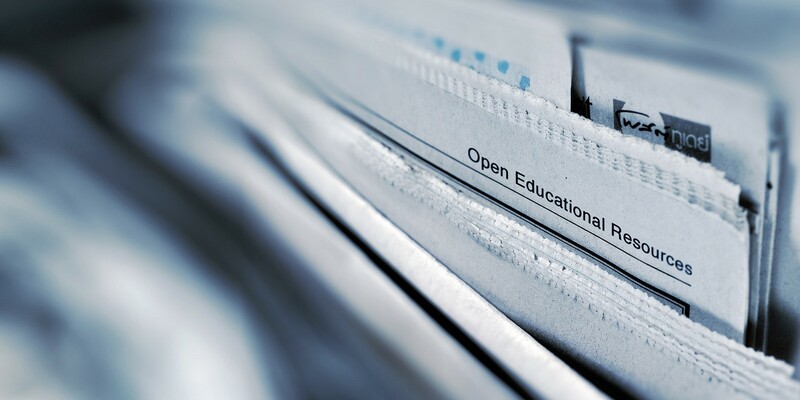 The wide range of approaches to open education shows that open access can transform education in a number of different ways, from learning platforms for refugees to open research. You can find information about the event and access presentations and videos from the keynote speakers and the OE Global webinar on the official website of the OE Global Conference. We have redesigned the Media Portal for STEM teaching - from today on it is purely an OER (open educational resource) portal. Our goal is to organize the Media Portal to be more attractive, more informative, and more useful for you. We’re sending you this letter to inform you about the changes to the Media Portal. Your opinion is important to us and we’re grateful for your feedback, which you can send to medienportal@siemens-stiftung.org. How time flies! We went online with the portal for the first time in May 2009 with 600 media on the topics of energy, the environment, and health. Since then, our media offerings have continually expanded. In 2015, we officially joined the OER movement, meaning that all the materials we create can be downloaded, edited, and shared. The Media Portal currently offers over 3,500 OERs for use in science and technology subjects. The media are available in German, English, and Spanish. Your use of the Media Portal encourages us in our work! On the Media Portal, you will now find exclusively OERs, which means that you can download, edit, and share all media without registering. In the future, you will no longer be able to access older media on the Media Portal that were not available under a free license. However, we’re in the process of converting more and more media to OER. When you search for media in the future, you’ll be able to decide whether you want to search for media packages or individual media files. In addition, we have improved our filtering and sorting functions so that you can quickly find what you’re looking for. You’ll be able to store and manage media and media packages in personalized bookmark lists in the future. The bookmark list function allows you to view, download, and easily share grouped media with colleagues or students. You can maintain different bookmark lists for individual classes. In the “Methods” area, you will find information about selected teaching methods and forms of learning for science and technology education, such as web-based training on “Service learning in STEM subjects.” Sample materials are linked for implementation of the methods. There will be a separate student area with a selection of suitably prepared media on the topics of energy, the environment, and health for browsing, trying out, or experimenting. In the “News” area and in our newsletters, we will continue to provide you with current information about OER, interesting events, and tips for other portals. We hope you enjoy browsing and reading, and we look forward to receiving your feedback! The OE Global Conference is hosted by the University of Technology in Delft and the Open Education Consortium. Siemens Stiftung will also be involved again: We are looking forward to giving the introductory speech for the Educator Award for Excellence as part of the many awards at the OE Global. This award honors educators who actively promote the development or use of open educational resources by creating innovative, effective solutions. All persons interested in attending the conference still have until April 16 to register. Additional information about the conference is available here. Registration is open until April 8. The camps for OER practitioners will take place at four different locations. The kickoff is in Bad Wildbad (Black Forest) on May 11, followed by the camps in Leipzig on May 25 and 26, in Hattingen (Ruhr district) on June 8 and 9, and in Hamburg on June 15 and 16, 2018. The OERCamps consist of an official workshop program and contributions in the BarCamp format. This gives you the opportunity to spontaneously offer your own session at the venue. The event is organized by the ZLL 21 e.V. nonprofit association. Participation is free. You can also follow the hashtag #OERcamp18 on Twitter!